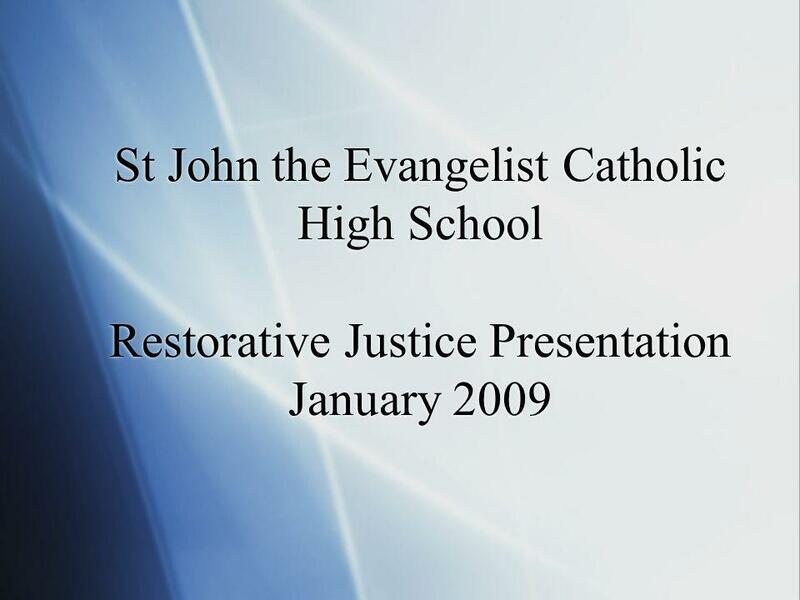 St John the Evangelist Catholic High School Restorative Justice Presentation January 2009. 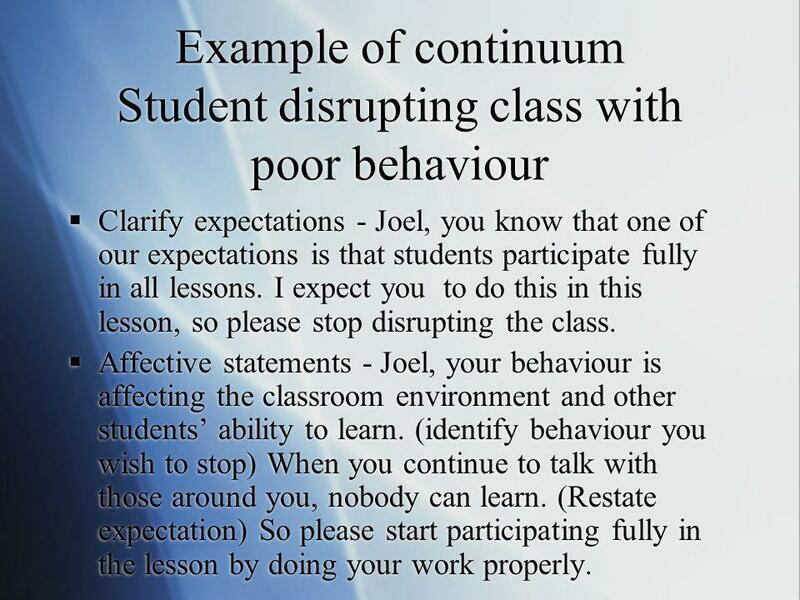 7 Example of continuum Student disrupting class with poor behaviour Clarify expectations - Joel, you know that one of our expectations is that students participate fully in all lessons. I expect you to do this in this lesson, so please stop disrupting the class. 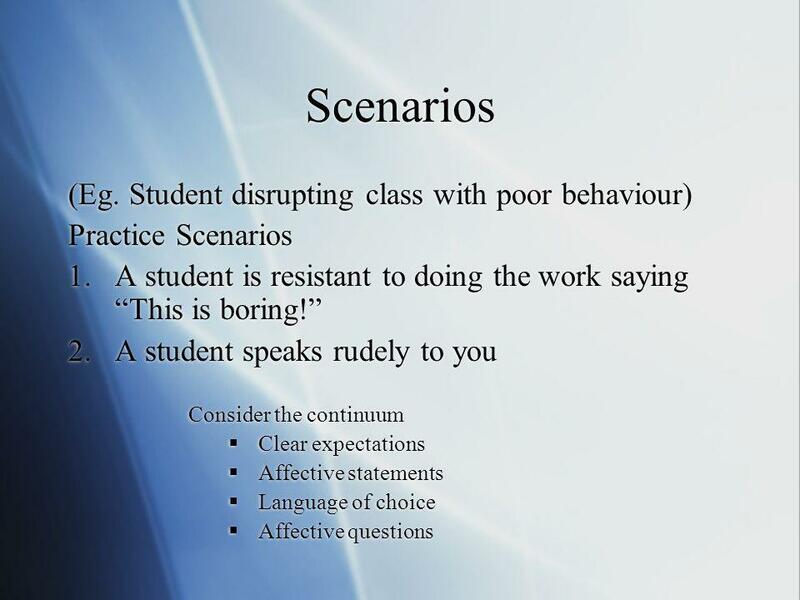 Affective statements - Joel, your behaviour is affecting the classroom environment and other students ability to learn. (identify behaviour you wish to stop) When you continue to talk with those around you, nobody can learn. 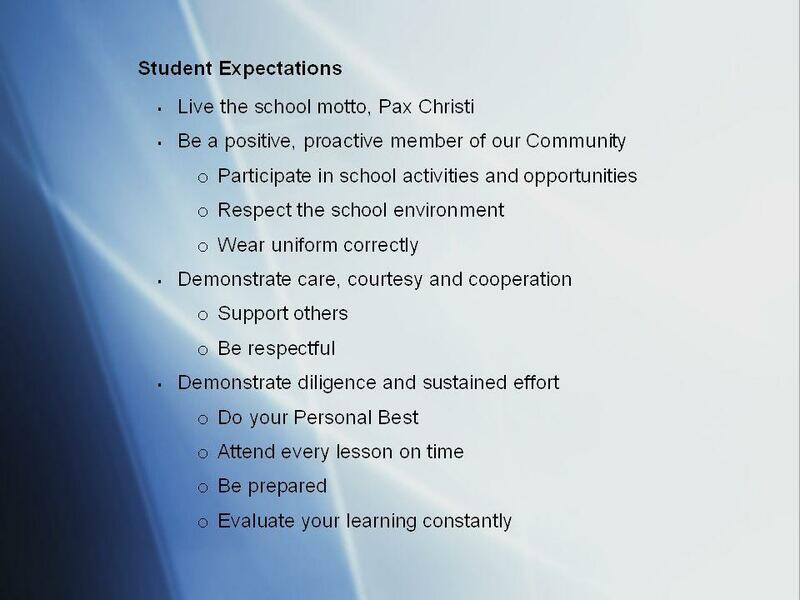 (Restate expectation) So please start participating fully in the lesson by doing your work properly. Clarify expectations - Joel, you know that one of our expectations is that students participate fully in all lessons. I expect you to do this in this lesson, so please stop disrupting the class. 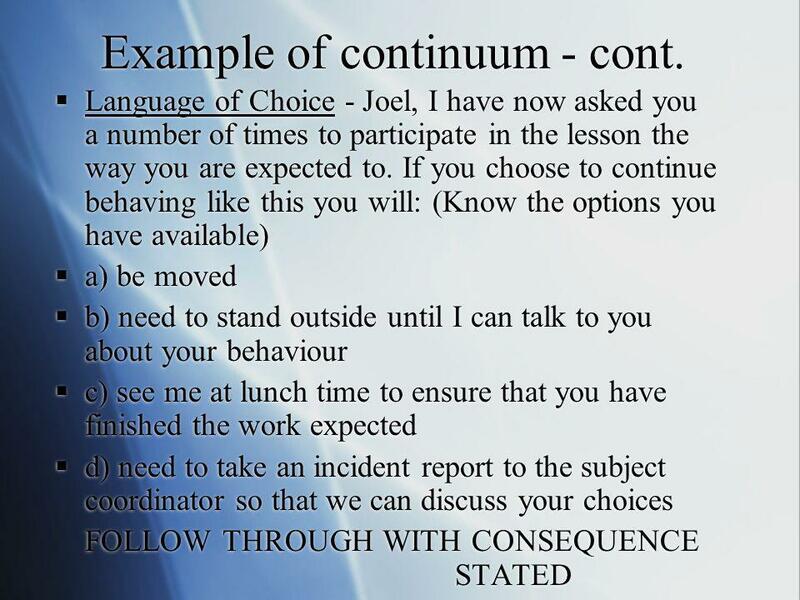 Affective statements - Joel, your behaviour is affecting the classroom environment and other students ability to learn. (identify behaviour you wish to stop) When you continue to talk with those around you, nobody can learn. (Restate expectation) So please start participating fully in the lesson by doing your work properly. 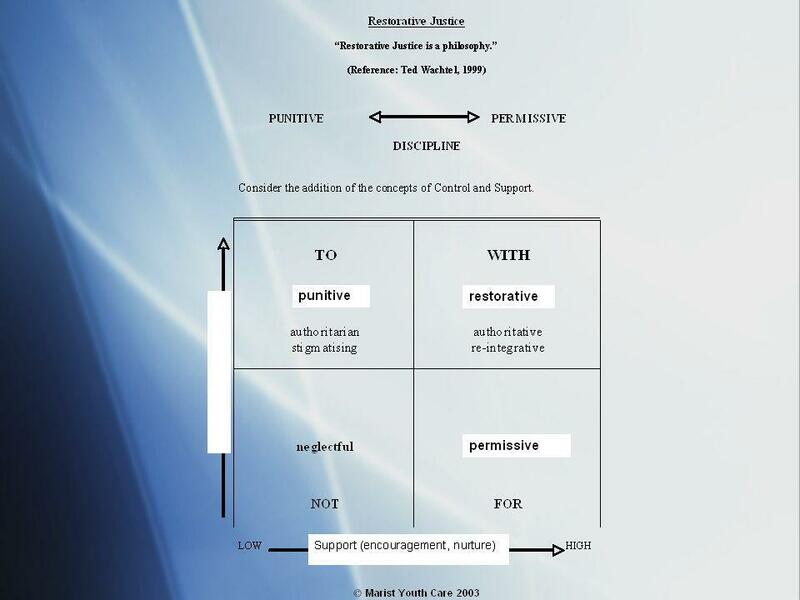 Download ppt "St John the Evangelist Catholic High School Restorative Justice Presentation January 2009." 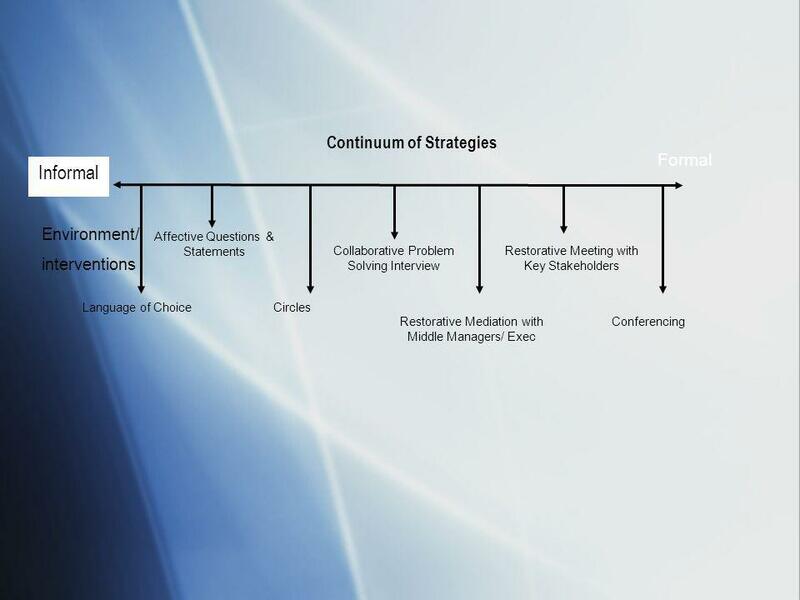 N ON -D IRECTIVE I NTERVENTION T HEORIES Carl Rogers – Humanism Dr. Thomas Gordon – Teacher Effectiveness Training. Two questions to reflect upon: 1. 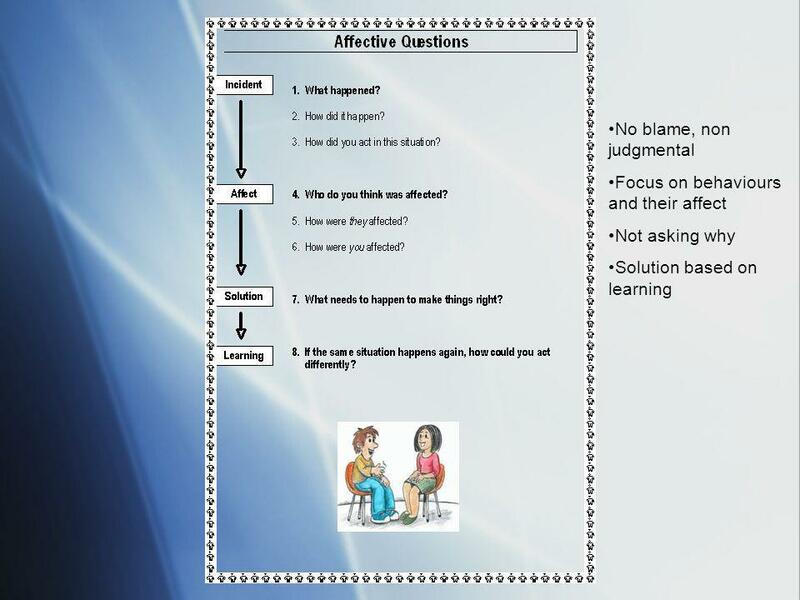 What do I know already about effective Behaviour Management? 2. What would I like to find out / be able to do better. Produced by the Riverina Schools Project Partnership, 2009 Talk To Me Lesson Fourteen Using Language to Solve a Problem Revision. CourtesyConsiderationCooperationCommon Sense RESPECT FOR YOURSELF RESPECT FOR OTHER PEOPLE RESPECT FOR THE SCHOOL & COMMUNITY Being active in your own. 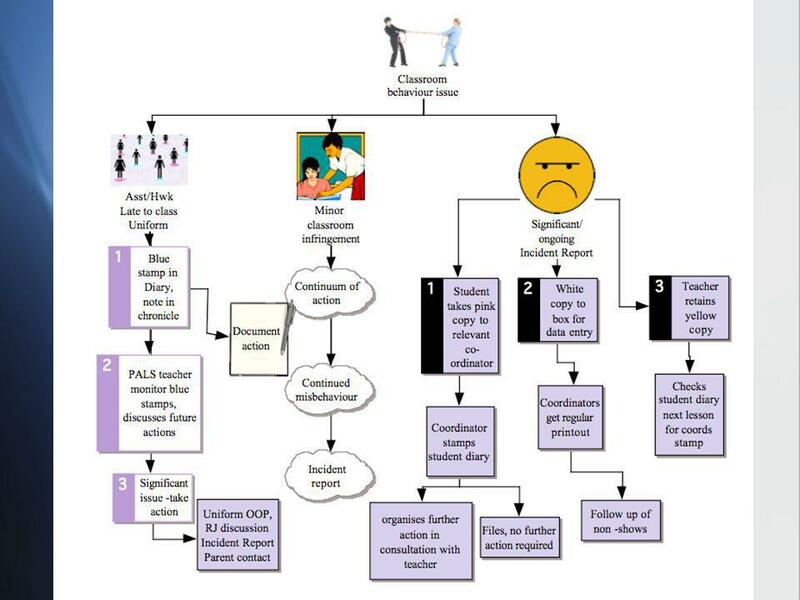 Scenario 2: Starting a lesson in an orderly way Behaviour Scenarios Resources to support Charlie Taylor’s Improving Teacher Training for Behaviour This. Resources to support Charlie Taylor’s Improving Teacher Training for Behaviour Behaviour Scenarios Scenario 15: Responding to a pupil who refuses to follow. Behavior Interventions: A System Approach Donna K. Milanovich, Ed.D. Randal A. Lutz Baldwin-Whitehall School District. 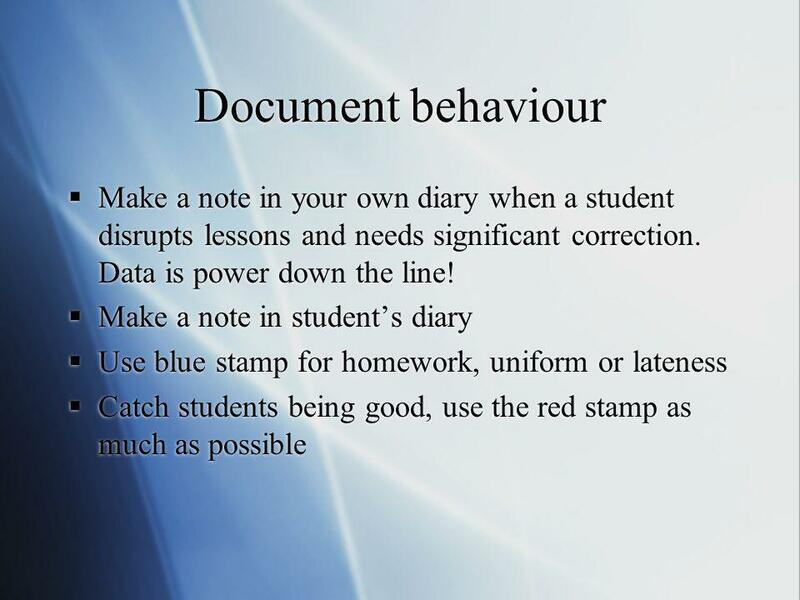 Behaviour Management. Divide the subject into 2 Behaviour enforcement (consequences, strategies, personalise, scenario activity) Positive behaviour management. Welcome Back Learn about our classroom rules and procedures. 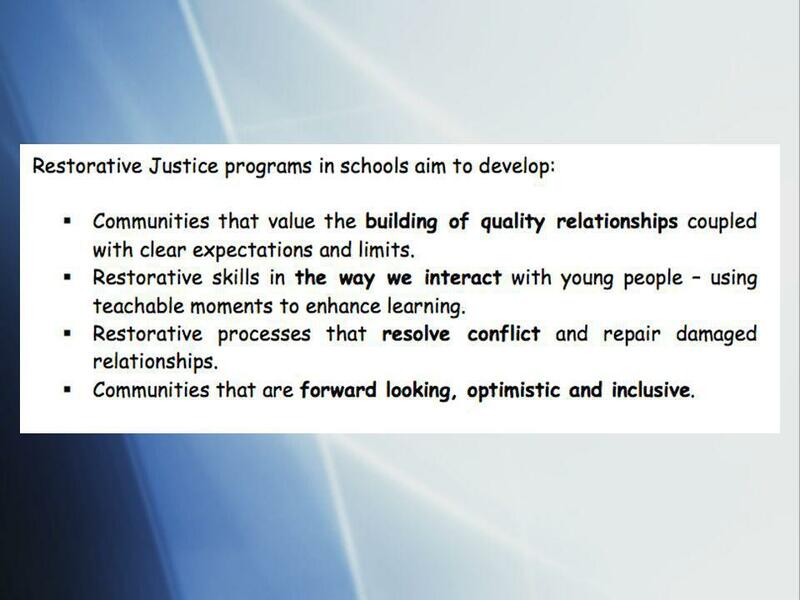 Lynne Russell – Director Restorative Justice 4 Schools. Information You Need To Know About Redding Middle School. Social Skills Lesson, December 14, 2012. What is interrupting?  When you interrupt someone, you talk when they are talking.  It can be very rude to.